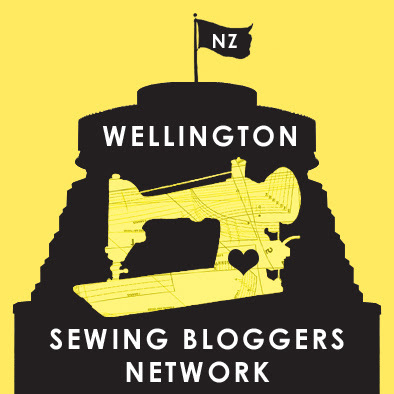 Festive sewing part 1: Party Dress! Warning: This post contains an excessive amount of sparkle. For the first time in six years, I get a holiday over The Holidays! I’m really looking forward to it, I’ve worked either Christmas or New Year for the last several years (the joys of working in a 24/7 job! ), but now that I’ve sold my soul and gone to work in the private sector, we get to close for several weeks over the festive season. We also get invited to a big Christmas cocktail party, which has caused me some anxiety. I’m really not the small-talk-and-mingle type, and I find these sorts of social occasions can be stressful and exhausting! Of course, they can be lots of fun too, which is why I’m going. I’ve even made a new dress for the occasion! Now, this dress is outside of my comfort zone for a few reasons…its relatively short, its pretty shapeless, and its GOLD AND SHINY. But, I’m kind of loving it anyway! I modified my Deer and Doe Datura blouse pattern into a dress by just lengthening the side seams and straightening out the hem, it was super simple! I also cut the back on the fold, rather than making it button down the centre back, even though that would have been cute. i just felt like there was quite a lot going on with the fabric already! So that made things seriously unfun. 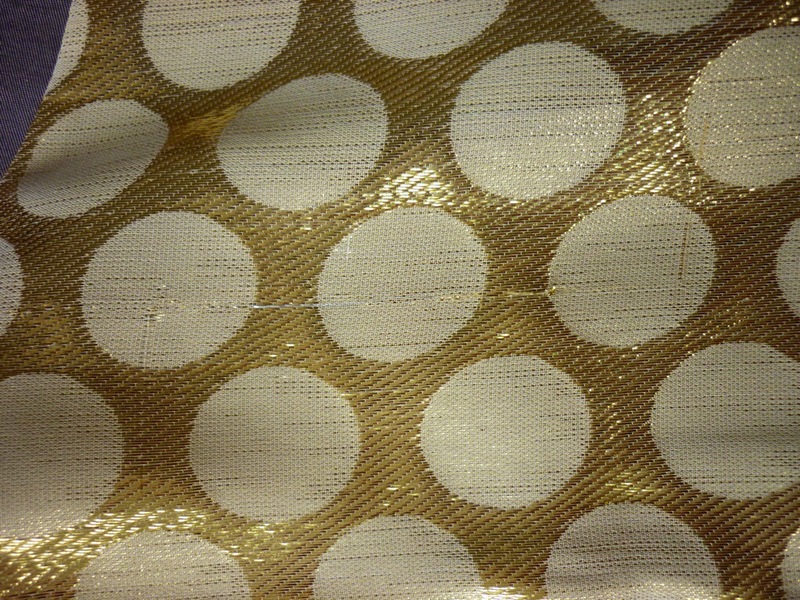 It shows up more on the gold side of the fabric, of course, so I could see just how many flaws I was causing as I sewed! I also had a bit of drama trying to get the clever lining origami thing to work with the shoulder seams, I couldn’t match the instructions and the picture with what i had in front of me, which made for an irritating and frustrating 10 minutes. I got it eventually, and have written myself out detailed instructions for next time! I had a similar struggle the first time I made the Datura, so I should have learned from that! 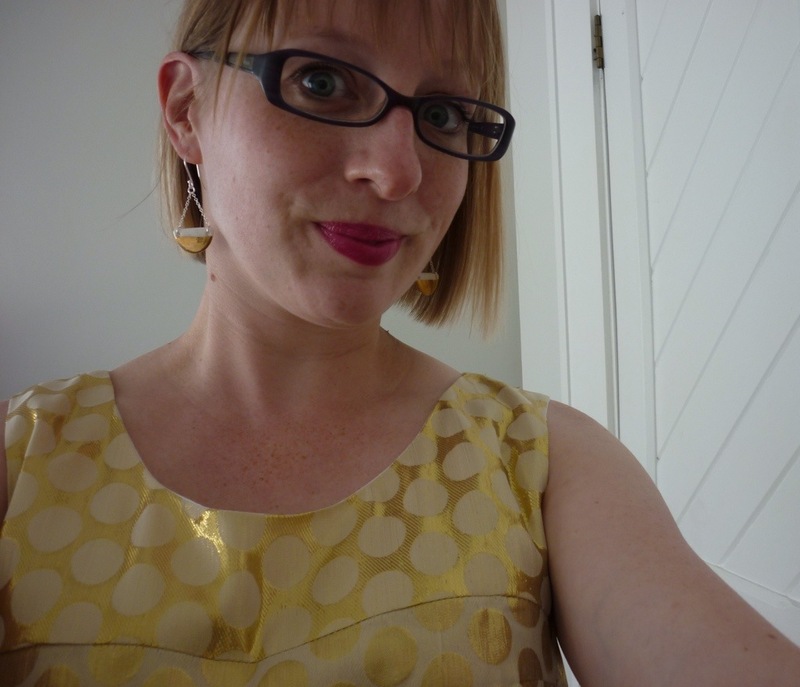 I hand sewed as much of this dress as I could, uncharacteristically, just to avoid the thread pulling. The lining is hand stitched down, and the hem is hand picked. All of the other seams are french seamed. One last photo, silly face but I want to show off my new favourite earrings! I asked Monsieur to take some photos showing some of the detail on the dress while I was wearing it, but I just ended up with photos of my arm pit (the armscye), and my neck and chin (the neckline), so I gave up. Sweet of him to try!